Your success as a Proposal Manager depends on your ability to respond to Request For Proposal documents, understand the procurement process, write compelling responses, and coordinate your team during the writing process. However, even with the best will in the world, unless you have guidelines, templates and checklists in place, you may jeopardize your own efforts, especially if you overlook one key requirement in the bid document. Here’s how to avoid this. Unless you organize the Proposal development process, your success as a Proposal Manager will be severely under-minded. One way to avoid this is to create easy to use checklists that your Proposal writing team can follow. And, more important, help automate the writing process as much as possible. How to identify, review and select Request For Proposals. Sales Manager schedules meeting to review new Request For Proposals. Sales Manager & Bid Manager decides which Request For Proposal to bid for. Review selected tenders in advance of Monday meeting. How to schedule, assign and plan Request For Proposals responses. Review last week’s proposals, highlight issues, and plan week ahead. Discuss Proposal Team members and who will write each bid document. Contact staff members required to contribute to the tender, e.g. Developer. Agree date for proposal to be completed, e.g. 48 hours before submission date. Update the Proposal spreadsheet on the Intranet. How to organize the bid team for each Request For Proposal. 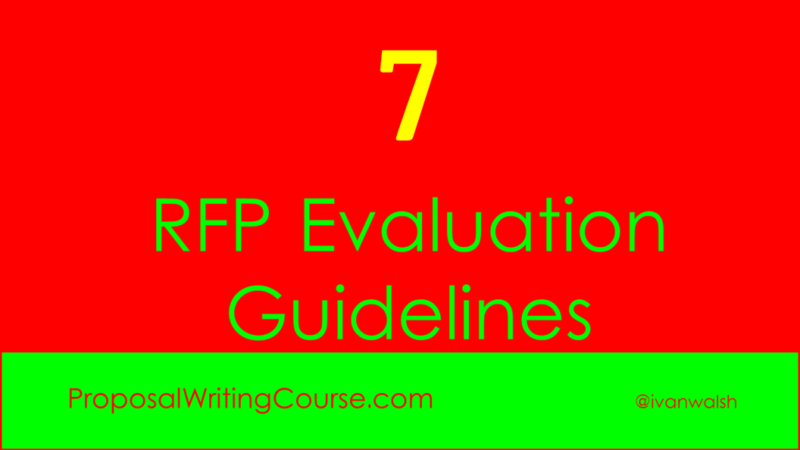 Read the RFP before starting any writing. Circulate the replies to team members. How to write, edit, and gather information for each Request For Proposal. Use the Business Proposals template. Confirm financial details with Finance Dept. Confirm resumes with Human Resource Dept. Team members return completed sections to Proposal Author for compilation. How to proof, review, edit each draft document. Proposal Author circulates compiled Draft 0.1 to team members. Team members review draft copies. Proposal Author collates next draft. How to test, proof, and circulate the draft Proposal. Send Draft to Proposal Manager 24 hours before deadline. Late documents cannot be fully checked. Proposal Manager checks Draft documents. Resolve queries with contributors. Proposal Manager returns Final Draft to Proposal Author. How to print, proof, and product the draft Proposal, especially if you need a hardcopy. Proposal Manager prints required number of hardcopies. Proposal Manager checks quality of final print. Prepare labels for large envelopes. Create CD-ROMs with company logo. and in case we forget, here’s number eight. How to archive, share, and prepare status reports on the Proposal. Proposal Manager files ‘Final Draft’ on shared drive. File supporting proposal documents in a sub-folder for reference. Update team members at Monday Meeting.